Islamabad (Web Desk): Imran Khan once again, has secured Chairmanship of Pakistan Tehreek-e-Insaaf PTI in the intra-party elections on Tuesday. 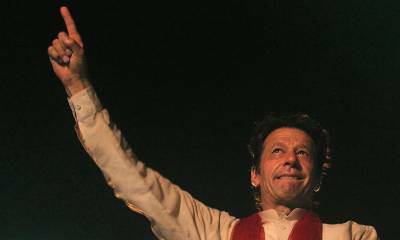 Khan bagged 189,055 votes in the elections against his rival Naik Muhammad Khan, whose panel received only 41,647 votes. Around 26,255 votes were rejected during the process. The PTI’s intra-party polls results revealed, Shah Mehmood Qureshi has also been re-elected as Vice Chairman and Jehangir Tareen as Secretary General of the party. Moreover, Arif Alvi has been elected as party’s Sindh President, while Yar Muhammad Rind, Aleem Khan, Faizullah Kamoka, Ishaq Khakwani and Amir Kiyani have been elected Balochistan, Central Punjab, West Punjab, South Punjab and South Punjab Regional respectively. PTI has submitted all details of the intra party polls with the Election Commission of Pakistan. According to detals, there were two panels; including Imran Khan led Insaf Panel and Naik Muhammad led Ehtisab Panel, which took part in the intra-party elections.